For other uses, see Fuzuli (disambiguation). 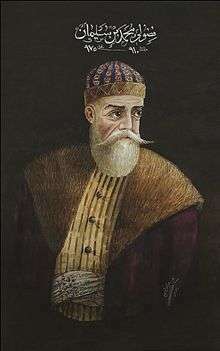 Fużūlī (Azerbaijani: Füzuli فضولی, c. 1494 – 1556) was the pen name of the Azerbaijani of the Bayat tribes of Oghuz poet, writer and thinker Muhammad bin Suleyman (Azerbaijani: Məhəmməd Ben Süleyman محمد بن سليمان). Often considered one of the greatest contributors to the Dîvân tradition of Azerbaijani literature, Fuzûlî in fact wrote his collected poems (dîvân) in three different languages: in his native Azerbaijani and also in Persian and Arabic. Although his Turkic works are written in the Azerbaijani language of the Turkic language family, he was well-versed in both the Ottoman and the Chagatai Turkic literary traditions as well. He was also well versed in mathematics and astronomy. Fuzûlî is generally believed to have been born around 1494 in what is now Iraq, when the area was under Ak Koyunlu Turkmen rule; he was probably born in either Karbalā’ or an-Najaf. He is believed to belong to Bayat tribe, one of the Turkic Oghuz tribes who were related to the Ottoman Kayı clan and were scattered throughout the Middle East, Anatolia, and the Caucasus at the time. Though Fuzûlî's ancestors had been of nomadic origin, the family had long since settled in towns. Fuzûlî appears to have received a good education, first under his father—who was a mufti in the city of Al Hillah—and then under a teacher named Rahmetullah. It was during this time that he learned the Persian and Arabic languages in addition to his native Azeri. Fuzûlî showed poetic promise early in life, composing sometime around his twentieth year the important masnavi entitled Beng ü Bâde (بنگ و باده; "Hashish and Wine"), in which he compared the Ottoman Sultan Bayezid II to hashish and the Safavid shah Ismail I to wine, much to the advantage of the latter. One of the few things that is known of Fuzûlî's life during this time is how he arrived at his pen name. In the introduction to his collected Persian poems, he says: "In the early days when I was just beginning to write poetry, every few days I would set my heart on a particular pen name and then after a time change it for another because someone showed up who shared the same name". Eventually, he decided upon the Arabic word fuzûlî—which literally means "impertinent, improper, unnecessary"—because he "knew that this title would not be acceptable to anyone else". Despite the name's pejorative meaning, however, it contains a double meaning—what is called tevriyye (توريه) in Ottoman Divan poetry—as Fuzûlî himself explains: "I was possessed of all the arts and sciences and found a pen name that also implies this sense since in the dictionary fuzûl (ﻓﻀﻮل) is given as a plural of fazl (ﻓﻀﻞ; 'learning') and has the same rhythm as ‘ulûm (ﻋﻠﻮم; 'sciences') and fünûn (ﻓﻨﻮن; 'arts')". Selâm verdim rüşvet değildir deyü almadılar. I said hello, but they didn't accept as it wasn't a bribe. Though his poetry flourished during his time among the Ottomans, the loss of his stipend meant that, materially speaking, Fuzûlî never became secure. In fact, most of his life was spent attending upon the Shi`ite Tomb of `Alî in the city of an-Najaf, south of Baghdad. He died during a plague outbreak in 1556, in Karbalā’, either of the plague itself or of cholera. The first of these lines, especially, relates to the idea of wahdat al-wujūd (وحدة الوجود), or "unity of being", which was first formulated by Ibn al-‘Arabī and which states that nothing apart from various manifestations of God exists. Here, Fuzûlî uses the word "love" (عاشق ‘aşk) rather than God in the formula, but the effect is the same. The ultimate value of the suffering of love, in Fuzûlî's work, lies in that it helps one to approach closer to "the Real" (al-Haqq الحق), which is one of the 99 names of God in Islamic tradition. District and city in Azerbaijan. Villages Füzuli in Shamkir and Füzuli in Samukh regions of Azerbaijan. Institute of Manuscripts. M. Fizuli in Baku. Boarding school them. M. Fuzuli in Ordubad district of Azerbaijan. Fuzuli. Leyla and Mejnun. Translated by Sofi Huri. Introduction and notes by Alessio Bombaci. London: George Allen & Unwin, Ltd., 1970. 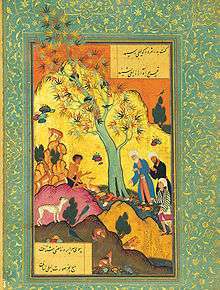 “ Fuzuli is credited with some fifteen works in Arabic, Persian, and Turkish, both in verse and prose. Although his greatest significance is undoubtedly as a Turkish poet, he is also of importance to Persian literature thanks to his original works in that language (indeed, Persian was the language he preferred for his Shi'ite religious poetry); his Turkic adaptations or translations of Persian works; and the inspiration he derived from Persian models for his Turkic works. ... The fundamental gesture of Fozuli's poetry is inclusiveness. It links Azeri, Turkmen and Ottoman (Rumi) poetry, east and west; it also bridges the religious divide between Shiism and Sunnism. Generations of Ottoman poets admired and wrote responses to his poetry; no contemporary canon can bypass him. In 1959, a town and the associated rayon in Azerbaijan were renamed after him. In 1996 the National Bank of Azerbaijan minted a golden 100 manat and a silver 50 manat commemorative coins dedicated to the 500th anniversary of Fuzûlî's life and activities. "Fozuli, Mohammad b. Solayman". Encyclopædia Iranica. Retrieved 25 August 2006. Document Type: Research Paper Authors: 1Aiyoub Koushan; 2Gholamreza Zyaee 1Faculty member, Department of Persian Literature, Tabriz Branch, Islamic Azad University, Tabriz, Iran 2Student, Department of Persian Literature, Tabriz Branch, Islamic Azad University, Tabriz, Iran. ↑ Peter Rollberg. The modern encyclopedia of Russian and Soviet literature (including Non-Russian and Emigre literatures) / Edited by Harry B. Weber. — Academic International Press, 1987. — Volume 8. — Page 76. In Mesopotamia Fuzuli was in intimate contact with three cultures — Turkic, Arabic, and Persian. Besides his native Azeri, he learned Arabic and Persian at an early age and acquired a through command of the literatures in all three languages, an accomplishment in which the cosmopolitan literary and scholarly circles of Hilla played an important role. ↑ Quoted in Andrews, 236. ↑ Great Soviet Encyclopedia. Fizuli (town in Azerbaijan SSR). ↑ Central Bank of Azerbaijan. Commemorative coins. Coins produced within 1992-2010: Gold and silver coins dedicated to memory of Mahammad Fuzuli. – Retrieved on 25 February 2010.